The Battle for Human Nature: Science, Morality and Modern Life. New York: W. W. Norton. Allocation of a complex, sequential operant on multiple and concurrent schedules of reinforcement. Journal of the Experimental Analysis of Behavior, 45, 321-335. Response stereotypy without automaticity: Not quite involuntary attention in the pigeon. Learning and Motivation, 17, 347-365. Behaviorism, intentionality, and sociohistorical structure. Behaviorism, 14, 193-210. (With H. Lacey). The insurance crisis is a moral crisis. Philadelphia Inquirer, April 26, 1986, p.9A. Why not a tax system for taxes only? Philadelphia Inquirer, August 28, 1986, p.23A. The explanatory power of radical behaviorism. In S. Modgil & C. Modgil (Eds. ), B. F. Skinner: Consensus and Controversy (pp.165-176). London: Falmer Press. (With H. Lacey). On the applicability of applicability. In S. Modgil & C. Modgil (Eds. ), B.F. Skinner: Consensus and Controversy (pp.178-180). London: Falmer Press. (With H. Lacey). What applied studies of human operant conditioning tell us about humans and about conditioning. In G. Davie (Ed. ), Conditioning in Humans (pp.27-42). New York: Wiley. (With H. Lacey). Capitalism and democracy. Tikkun, 2, 66-71. The experimental synthesis of behavior: Reinforcement, behavioral stereotypy, and problem solving. In G.H. Bower (Ed. ), The Psychology of Learning and Motivation (Vol. 22) (pp.93-138).. New York: Academic Press. Some disutilities of utility. Journal of Thought, 23, 132-147. For better politicians, lower their salaries. Philadelphia Inquirer, December 24, 1988. p. 9a. 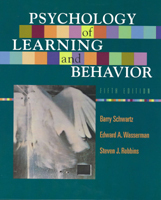 Psychology of Learning and Behavior (3rd Ed). New York: W.W. Norton. The creation and destruction of value. American Psychologist, 45, 7-15. King Midas in America: Science, morality, and modern life. In C. Walton (Ed. ), Enriching Business Ethics (pp.187-212). New York: Plenum. Psychology of Learning and Memory. New York: W.W. Norton. (With D. Reisberg). Attending to continuity and organizational goals. In S. Srivastva & R.E. Fry (Eds. ), Executive and Organizational Continuity: Managing the Paradoxes of Stability and Change (pp.101-131). New York: Jossey-Bass. On the creation and destruction of value. In M. Hechter, L. Nadel, & R.E. Michod (Eds), The Origin of Values (pp.153-186). Hawthorne, N.Y.: Aldine de Gruyter. Empathy, altruism and civic responsibility: The importance of multicultural education. In B. Schwartz (Ed. ), Educating for Civic Responsibility in a Multicultural World. The Swarthmore Papers, 1, 61-70. Swarthmore, Pennsylvania: Swarthmore College. Why altruism is impossible...and ubiquitous. Social Service Review, 67, 314-343. The Costs of Living: How Market Freedom Erodes the Best Things in Life. New York: Norton. The meaning of health and the health of meaning. Tikkun, 9 (No. 6), 19-22,88. On morals and markets. Criminal Justice Ethics, 13, 61-69. The Psychology of Learning and Behavior (4th Edition). New York: W.W. Norton (With S. Robbins). Forming a new congregation: The uneasy tension between freedom and community. The Reconstructionist, 60, Spring, 48-56. Tolerance: Should we approve of it, put up with it, or tolerate it? Academe, 82 (3), 24-28. The formation and transformation of values. W. O'Donohue & R.F. Kitchener (Eds.) The Philosophy of Psychology (pp.321-340). London: Sage. (With H. Lacey). Psychology, "idea technology," and ideology. Psychological Science, 8, 21-27. Is "good enough" good enough for Swarthmore? Swarthmore College Alumni Bulletin, September, pp.16-17. Domain specificity of fairness judgments in economic transactions. Journal of Economic Psychology, 18, 579-604. (With D. Seligman). Censure, but please no fine. The Swarthmorean, January 22, p.5. Capitalism, the market, the "underclass," and the future. Society, 37, 33-42. Self-determination: The tyranny of freedom. American Psychologist, 55, 79-88. Pitfalls on the road to a positive psychology of hope. In J. Gillham (Ed.). The Science of Optimism and Hope (pp.399-412). Radnor, PA: Templeton Foundation Press. The Costs of Living: How Market Freedom Erodes the Best Things in Life. Philadelphia: Xlibris. [Republication of 1994 book]. Who gets the gift of admission to a selective college? The Swarthmorean, February 2 2001, p. 5. Freedom and tyranny: Descriptions and prescriptions. American Psychologist, 56, 80-81. Maximizing versus satisficing: Happiness is a matter of choice. Journal of Personality and Social Psychology, 83 (5), 1178-1197. Choice overload burdens daily life. USA Today, January 5, 2004, 13A. The tyranny of choice. Chronicle of Higher Education, January 23, 2004, B6-B8. A nation of second guesses. New York Times, January 22, 2004, A27. The tyranny of choice. Scientific American, April, 2004, 71-75. Competing for welfare: The idea that choice will enhance the NHS is a myth. The Guardian, June 23. Doing better but feeling worse: The paradox of choice. In P. A. Linley, & S. Joseph (Eds. ), Positive Psychology in Practice. Hoboken, N.J.: John Wiley and Sons, pp. 86-104. (With Andrew Ward). Choose and lose. New York Times, January 5, Op-ed page. Explaining away responsibility: Effects of scientific explanation on perceived culpability. Behavior and Ethics, 15, 139-158. (With John Monterosso and Edward B. Royzman). Doing Better but Feeling Worse: Looking for the "Best" Job Undermines Satisfaction. Psychological Science, 17(2), 143-150. Is freedom just another word for many things to buy? New York Times Magazine, February 26, 2006. (With Hazel Rose Markus and Alana Conner Snibbe). Navigating the paradox of choice. ECR Journal, 6 (No. 1), 38-49. More isn't always better. Harvard Business Review, 84 (No. 6), 22. Practical wisdom: Aristotle meets positive psychology. Journal of Happiness Studies, 7, 377-395. (With Kenneth Sharpe). The "sunk cost fallacy." Los Angeles Times, Sunday Current, September 17, M5. The pain of selling your house. Los Angeles Times, October 20, B13. The quest for the perfect gadget. Men's Health, December, 6-20. Made to Stick: Why Some Ideas Survive and Others Die. [Book Review] Washington Post, January 17. Stop the treadmill! London Review of Books, 29 (5), 32-33 (March 8). Why the best schools can't pick the best kids-and vice versa. Los Angeles Times, Currents, March 18, M1, M3. Buyer beware: Are we training our kids to be consumers rather than citizens? Washington Post Book World, April 8, 2007, p.8. Unnatural selections. The New York Times, April 12, 2007, A23. Can you say no to too many choices? Spirituality and Health, May-June, 2007, 58-61, 92. Money for nothing. New York Times, July 2, A21. "Leaky" rationality: How research on behavioral decision making challenges normative standards of rationality. Perspectives on Psychological Science, 2, 162-180. (With Daniel J. Keys). There must be an alternative. Psychological Inquiry, 18, 48-51. When words decide. Scientific American Mind, August/September, 36-43. Information overload. Journal of Life Sciences, November, 80-84. Bonus babies. New York Times, October 24, A-19. Practical wisdom: Aristotle meets positive psychology. Journal of Happiness Studies. (With Kenneth Sharpe). Can there ever be too many flowers blooming? In S.J. Tepper & B. Ivy (Eds. ), Engaging Art: The Next Great Transformation of America's Cultural Life (pp. 239-256). New York: Routledge. The real third way. The American Prospect, 19 (6), 39-41. A short form of the Maximization Scale: Factor structure, reliability and validity studies. Judgment and Decision Making, 3, 371-388. (With G. Y. Nenkov, M. Morrin, A. Ward & J. Hulland). Measuring U.S. well-being. Philadelphia Inquirer, January 9, p. A19. The maximization paradox: The costs of seeking alternatives. Personality and Individual Differences, 46, 631-635. (With C. D. Rawn, I. Dar-Nimrod, and D. R. Lehman). Choice, incentives, and education. Oxford Review of Education, 35, 391-403. [Special issue on well being in schools]. Happiness. Foreign Policy, May/June, p.88. Be careful what you wish for: The dark side of freedom. In R. M. Arkin, K. C. Oleson, and P. J. Carroll (Eds. ), Handbook of the Uncertain self: Perspectives from Social and Personality Psychology (pp. 62-77). New York: Psychology Press. When more is less: The paradox of choice in search engine use. Proceedings of the the 32nd Annual ACM SIGIR Conference, July, 2009. (With A. Oulasvirta and J. Hukkinen). Tyranny for the commons man. The National Interest, July/August (102), 64-73. The dark side of incentives. Business Week, November 23. The limits of cost-benefit calculation: Commentary on Bennis, Medin, & Bartels (2010). Perspectives on Psychological Science, 5, 203-205. Does choice mean freedom and well being? Journal of Consumer Research, 37, 344-355. (with H. Markus). Education and the metrics of evaluation. Cardozo Law Review, 31, 2083-2087. Too much of a good thing: The challenge and opportunity of the inverted-U. Perspectives on Psychological Science, 6, 61-76. (with A. M. Grant). Practical Wisdom: The Right Way to Do the Right Thing. New York: Riverhead. (with K. Sharpe). A new veil of ignorance? Perspectives on Psychological Science, 6, 19-20.
Who likes evolution: Dissociation of human evolution versus evolutionary psychology. Journal of Social, Evolutionary, and Cultural Psychology, 5, 122-130. (with A. Ward and M. Wallaert). Flourishing and its enemies: The ideology of self-interest as self-fulfilling. In D.K. Swearer & S.L. McGarry (Eds. ), The Ecologies of Human Flourishing (pp. 175-194). Cambridge: Harvard University Press. The choices that matter. In M. B. Stanier (Ed. ), Ending Malaria. New York: The Domino Project (pp. 39-40). What makes a good decision? Robust satisficing as a normative standard of rational decision making. Journal for the Theory of Social Behaviour, 41, 209-227. (with Y. Ben-Haim & C. Dacso). Creating an economy that won't cheat the future. Solutions, 2 (5), 71-74. Practical wisdom and organizations. In B.M. Staw & A.P. Brief (Eds.). Research in Organizational Behavior, 31, 3-23. New York: Elsevier. Can consumers be wise? Aristotle speaks to the 21st century. In D. G. Mick, S. Pettigrew, C. Pechmann, and J. Ozanne (Eds. ), Transformative Consumer Research for Personal and Collective Well-Being (pp. 663-680). New York: Routledge. (with D. G. Mick). The upside of the downturn. Chronicle of Higher Education, January 22. A quick guide to the economy. Think friction. New York Times Review, February 19. Colleges should teach intellectual virtues. Chronicle of Higher Education, February 19. "Human nature" is often the product of nurture. Wired UK, April, 65. Crowding out morality: How the ideology of self-interest can be self-fulfilling. In J. Hanson (Ed. ), Psychology, Ideology, and Law (pp. 160-184). New York: Oxford University Press. Lotteries for college admissions. The Atlantic, July/August, p.65. Choice, freedom, and autonomy. In P. R. Shaver & M. Mikulincer (Eds.). Meaning, Mortality, and Choice: The Social Psychology of Existential Concerns (pp. 271-288). Washington, D.C. APA Press. Did your brain make you do it? New York Times, July 29. (with J. Monterosso). Affective forecasting and well being. In D. Reisberg (Ed. ), Oxford Handbook of Cognitive Psychology. New York: Oxford University Press. (with R. Sommers). The psychological consequences and normative limitations of maximizing. In M. Zeelenberg (Ed. ), Behavioral Economics and Economic Psychology. London: Psychology Press. America is broken. None of the institutions we rely on—schools, clinics, courts, banks—give us what we want and need. Our efforts to repair these institutions rely on two tools—rules and incentives. Neither can do the job. What is needed in addition is virtue—character—and especially the virtue that Aristotle called "practical wisdom." Practical wisdom entails the will to do the right thing and the skill to figure out what the right thing is. Psychological research tells us that whereas people aren’t born wise, they are born to become wise, if they have the right experience. And rules and incentives provide the wrong experience. Too many rules undermine the development of skill and too much reliance on incentives undermines the needed will. This book discusses what practical wisdom is, why we need it, and how current institutional practices threaten it. It also describes some examples of practices that nurture wisdom instead of undermining it. As Americans, we assume that more choice means better options and greater satisfaction. But beware of excessive choice: choice overload can make you question the decisions you make before you even make them, it can set you up for unrealistically high expectations, and it can make you blame yourself for any and all failures. In the long run, this can lead to decision-making paralysis. And in a culture that tells us that there is no excuse for falling short of perfection when your options are limitless, too much choice can lead to clinical depression. This textbook on the psychology of learning presents the basic principles, theories, and research findings on simple associative learning. It's focus is on conditioning proceses in animals, though applications to human behavior are frequently discussed. The book tries to present an up-to-date picture of a field that has been at the heart of experimental psychology for more than a century. Americans have come to view more and more of their lives in free-market, economic terms. Market thinking has permeated education, the professions, sports, family and friendship, and politics. This book presents a criticism of this market view of life, arguing that most of what is good about education, medicine, law, sports, love, friendship, and democratic politics is undermined if the market gets too close to them. Indeed, even the market stops working if people behave in it in the way that economists say people always behave. Thus, the book argues, the market erodes the best things in life, and must be restrained, not encouraged, in its movement into places where it doesn't belong. The book is aimed at a non-professional audience. This textbook combines a discussion of basic principles of conditioning, mostly derived from research with animals, with a discussion of basic principles of memory, mostly derived from research with human beings. This book presents a brief review of basic principles, research findings, and theories on simple associative learning. The emphasis is on the theoretical worldview of behaviorism, an approach to psychology that dominated the field for many years. Though willing to acknowledge the many contributions to our understanding that have been derived from a behaviorist perspective, the book is also critical of behaviorism, pointing out the limits to understanding that are inherent in that approach. This book is appropriate for readers with no background in psychology, either people who want a quick and comprehensible overview of research in this field, or people who are interested in looking at psychological theories from a philosophical perspective.